The International Va’a Federation was created in 1981. The founding members were (1) the Kalifornia Outrigger Association (KOA) which has been renamed Southern California Outrigger Racing Association (SCORA) in 2004, (2) the Hawaiian Canoe Racing Association (HCRA) and (3) the Federation Française de Pirogue Polynésienne (which has become the Fédération Tahitienne de Va’a). Originally the name of the federation was International Polynesian Canoe Federation (IPCF). Over the years it has become apparent that the term “Polynesian Canoe” did not take into account other Oceanian regions which can rightfully pretend to be also at the source of the outrigger canoe. This applied in particular to Melanesia and Micronesia. It has been discussed among the members of the federation what term could best reflect the designation of the canoe. It was clear that the original term of the canoe would have to be used. But what is the correct original term? In fact, in Aotearoa (New Zealand) the original designation is “Waka ama”, in Hawaii it is “Wa’a”, on the Marquesas Islands it is “Vaka”, in Tahiti “Va’a”… A decision had to be taken. The following question was raised in the members’ meeting: what does sound better: V1, V6 and V12 or W1, W6 and W12? After much discussion the members decided to adopt the name “Va’a” as the international designation for the outrigger canoe. 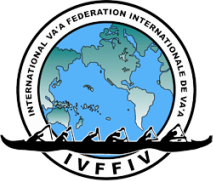 Accordingly, the International Polynesian Canoe Federation (IPCF) was renamed “International Va’a Federation (IVF)”. At the 13th World Sprints 2008 in Sacramento (USA), adaptive paddling was for the first time included in the official program as a fully recognized medal discipline. It is now referred to as Para Va'a around the world. The first IVF European Va’a Championship (designated for V1, V1r and V2r) took place in May 2009 in Italy. As the governing body of the international va’a sport, the IVF now counts more than 35 members and member areas.